Reservations are only confirmed upon receipt of a signed contract along with the groups deposit. Contracts can be paid by cash, money order, company check or Credit Card. Full cancellation of your reservation must be made MORE than 60 days prior to your groups arrival to receive a refund. Any full cancellations made LESS than 60 days will result in the lost of your 50% deposit. Changes to your reservation is subject to availability. Please notify us ASAP if your group size increases. Changes can be made 30 days before arrival with no penalty. Any changes less than 30 days prior to arrival will result in no refund. The final balance for your group is due 30 days prior to your groups arrival. When making a group booking, the hostel will contact you via email and send you a group contract confirming your reservations. Please sign and return the contract along with a 50% deposit within 14 days of receipt. The final balance is due 30 days prior to your arrival. Any changes to your contract must be in writing. Group assumes financial responsibility for any damages to the Hostel property resulting from your groups or production teams intentional or unintentional misuse or neglect. Group check-in begins after 3pm and check-out is before 11am. We will do our best accommodating early arrivals upon notification. The Broadway Hotel and Hostel is New Yorks number one boutique hostel, located in the trendy Upper West Side. 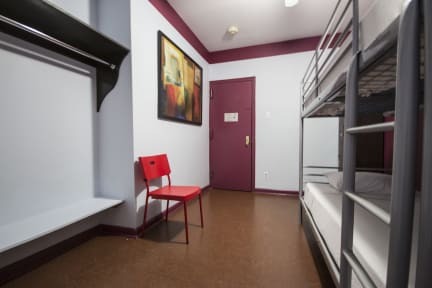 Experience a truly unique, chic and exciting boutique hostel in NYCs most trendy neighbourhood! We offer clean, comfortable, and affordable rooms for travellers in search of a real New York Experience. Here you can relax in accommodations that showcase vibrant colour tones, contemporary design, and a comfortable atmosphere. 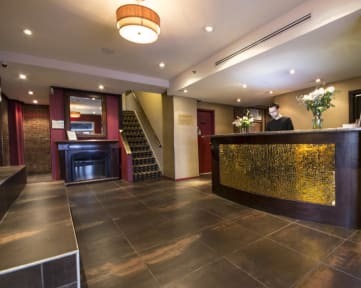 Gather in our New York hotel communal area and experience a multitude of cultures from travellers all over the world. We have spacious and comfortable two-bed dorms as well as newly upgraded private ensuite rooms featuring a flat-screen TV with cable, a coffee maker, comfortable beds and plush pillows. These newly renovated rooms feature bran new porcelain sinks, air conditioning and ceiling fans. We dont crowd loads of people into one room its perfect for families or friends who require a bit more privacy. Free daily linen changes are provided, as well as towels and pillows, along with daily housekeeping to all rooms. Our gourmet kitchen features a modern edged design mixed with vintage NYC architecture, including exposed original brickwork throughout, making this not only a great place to eat but a great spot to meet people from all over the world. Its equipped with a refrigerator, microwaves, a sink and storage cabinets with condiments. You can enjoy full access to our chic and plush guest lounge which features multiple seating and a state-of-the-art sound and lighting system with multiple plasma screens showing all the latest movies daily. Theres also an elegant library with intimate fireplace, our Nintendo Wii system on Game Days and free Wi-Fi in the guest lounge and lobby areas. You can use our internet stations and printer for a small fee. We have a business centre, ATM, vending machines and hairdryers. Our multilingual reception and security staff are on-hand 24hrs a day to assist you. We have an elevator and there is a bellman service provided to help guests with luggage and information. A shuttle service is available going to all airports (fees apply). Youre welcome to use our secure luggage storage facilities as well as the lockers. Theres no curfew or lockout so you can explore NYC at your own pace. Were located on the trendy Upper West Side, with one of New Yorks most famous and well-known addresses Broadway! Here youll be within walking distance to dozens of restaurants, pubs, clubs and trendy NYC lounges as well as Central Park, Columbia University and the largest Gothic cathedral in the world (St John the Divine), just to name a few. You can also hop on the subway (red line) just two blocks away and explore the heart of Times Square in minutes! NYC buses are just one block from here. Our great location, affordable rooms and excellent guest service are what make the Broadway Hotel and Hostel New Yorks hottest boutique hostel! Das Gebäude ist sehr alt und renovierungsbedürftig. Etwas dunkel in der Gemeinschaftsküche, aber gut gelegen und gutes Preis-Leistungs-Verhältnis. Nicht so überfüllt wie in anderen Hostels. Leider kein Innenhof. Wir waren zu zweit und hatten ein tolles privates Zimmer im 6. Stock. Die beiden Betten waren groß und der Raum war sauber. Bis auf ein Bad mit Dusche waren alle neu und sauber. Lage top, Linie 1,2 und 3 in wenigen Minuten erreichbar. The kitchen does not deserve to be titled like this. You cannot even cook because there is only a microwave. For a backpacker it is not possible to cook for saving money. The information that the airport is 25 Minutes away is totally wrong. You will need nearly two hours and the Shuttle service of the hostel has to departure 5 hours before your flight starts. So you have to plan with a lot more time. Die Badezimmer waren dreckiger, das Personal hat sich spät abends noch laut auf den Fluren unterhalten. In dem 2-Bett Frauenschlafsaal war plötzlich ein Mann, an der Rezeption sagte man mir, dass dies ein Fehler sei und der Mann das Zimmer wechseln würde sobald er wieder im Hostel ist (sie sagten mir dass sie ihn am Empfang anfangen werden). Gegen 22 Uhr stand er dann plötzlich in meinem Zimmer - ihm wurde an der Rezeptionen nichts über den Zimmeraustausch gesagt. I booked a bed in a dorm room for two weeks and left after 3 nights! Same did my roommate. This Hostel is just terrible! The bathroom, which I was sharing with an unknown amount of people was dirty all time, e.g. urine everywhere! It was just so disgusting! The room was super small. And during nights there was this woman, who seemed to live in the Hostel, screaming to a cat and also knocking on the dorm room's door. Receptionists did not care after informing them! I felt disgusted and not save! Gebucht hatte ich ein Damen-Schlafsaal und aufgewacht bin ich morgens mit einem Mann im anderen Bett! Geht gar nicht!!! Obwohl Kreditkarte als Zahlungsmittel in den Bedingungen erscheint, musste ich cash bezahlen. Ebenfalls unverständlich! Ganz schlechtes Hostel, unfreundlich und nicht kooperativ. Nicht zu empfehlen. ATTENTION---WARNING---This Hostel/Hotel charged me more than 350 Dollars too much and did not refund it !!! Customer Service called the Manager without result until now. Im very angry!! !